Today Michael Tierney was working on the 4600 block of Milwaukee Avenue in Chicago. 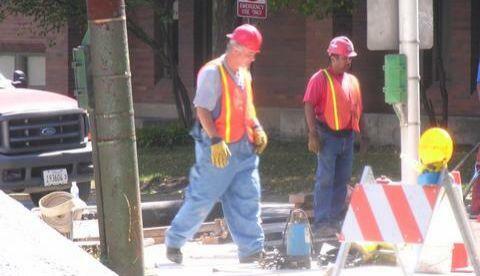 The Contractor is Reliable a favored contractor for Mayor Daley and the City of Chicago. I can see that Tierney is working for a Clout based company but as a Caulker/Plumber? Tierney was a High ranking Chicago Water Department Employee under Donald Tomczak. City workers thought he would get a Plumber’s Local 130 Business Agent job from his father-in-law, Thomas J. McManus. At least other high ranking retired workers got some sweet spots. Like Rottman and William Chambers. If Mike did you a favor or two, show some class and say “Hello”. Do not forget your friends.